My recent trip to the Trietiakov gallery in Moscow triggered an interesting thought process. I was able to look straight into the face of Spas- the Saviour by Andriej Rublow(ca.1360-1430). The only thing dividing me from the famous icons was a rope hanging about 30 cm from the painting. A couple of Asian tourists took a few pictures and left. What would stop them,or me, from potentially damaging the treasures of the world's heritage? If in a feat of madness one of us decided to do it, would an identical copy replace the priceless originals? In 2006, at the Fitzwilliam Museum in Cambridge, a seventeenth centuryChinese porcelain vase from Qing Dynasty was knocked down by a visitor and smashed into pieces.There have been cases in the past where upset viewers or mentally ill people attack art objects. Museums need to be ready for cases like the above as well as plunders resulted by military conflicts. 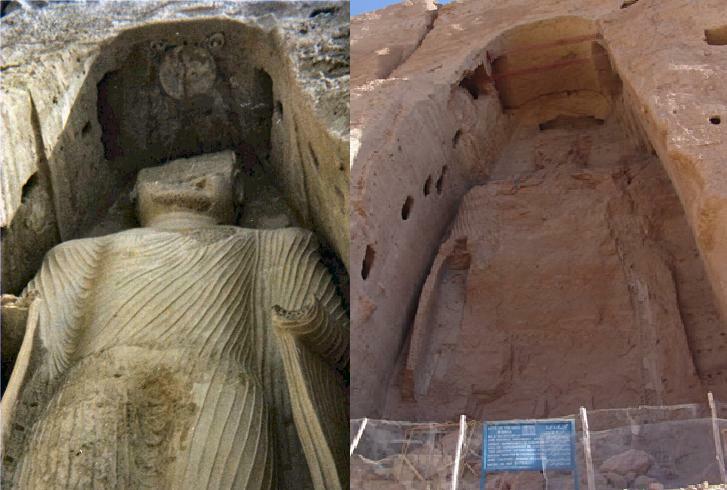 We would still be able to enjoy the 1,700 year old Great Buddhas of Bamiyan in Afghanistan, had they not been blown up in 2001 by the Talibans as an unwanted sign of the Buddhist past of the region. Recently, the Centre for Digital Documentation and Visualisation started a project aiming to record the precious monuments of the past before they perish for natural or any other reasons. One of the targets is an 11th century Raniki Vav step well in western India. Project partners include the National Park Service, Historic Scotland, Glasgow School of Art, and CyArk, a non-profit organisation recording cultural heritage sites worldwide. Figure 3: A 3-D virtual copy of a stone carving of Kalki, an incarnation of Vishnu from the 11th century fieze decorating an Indian well. The idea is praise worthy, but in reality, viewers want to interact with original art. There have been critical voices when Tutankhamun’s beautifully painted tomb chamber was replaced with a replica. Some voiced concerns about copies potentially being displayed in China and Japan. What is the point of travelling to the original site in a foreign country if a copy can be viewed in a local museum? Protection is one thing, recording- another. The way we record and store data seems to be speeding up day by day. Floppy discs and VHS tapes have been discarded onto the digital dust bin long ago. In 1977 the United States sent a satellite as part of the Voyager programme with gold records as a message to foreign civilisations.The records include the greatest pieces of music ever written, sounds of nature and a crying baby. Attached are blueprints of how to access the data on those mediums. Even though produced not even 40 years ago, only few of us still have the equipment to do so. It seems the old way is the best way.The Parliamentary Archives, the formal record of all the business of the British Houses of Commons, Lords and Committees, are still continuing the long lived custom of handwriting every single legal bill on calfskin, produced by the same factory near Milton Keynes. All of them are carefully stored in Westminster at the Victoria Tower in a specially air-conditioned room. The vellum has an average life expectancy of 500 years, definitely longer than the floppy disks were ever hoped to be used. Figure 4: Thousands of vellum rolls stored in the The Parliamentary Archives costing thousands of pounds and lives of numerous calfs. Extravagance of necessity? Good old solid, tangible records of art are priceless, even if they were not produced for the puropse of recording itself. After Warsaw perished in the II World War, thea rchitects rebuilt the city using paintings by Belotto Canaletto (1721-1780) to recreate the buildings and even their colours. An example shows how the church of the Holy Cross resurrected from a pile of bricks resembling a trampled Lego set. There was no available colour photography at the time and human memory is not to be trusted- this is when old paintings saved the day. Recording is the answer to one of basic human needs to pass the message to future generations and preserve the knowledge and experience. It is what helped us to create history, which is counted from the moment we started recording. There are many ambiguities about recording or copying art but as long as copies are named, displayed or sold as copies, we should all rest assured we get what we expect. Cover Image: Priceless icons displayed at the Trietyakov gallery in Moscow and careless tourists.